Anacostia Community Museum, 1901 Fort Place, SE. ACC is a member of the PayPal Giving Fund. 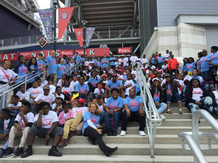 You can donate to our annual Ward 8 Kids with Natitude campaign through this link. portal. ﻿You can now pay your membership or donate by PayPal. Simply select the appropriate membership/donation level from the dropdown list below and click "Subscribe". If your organization would like to donate an amount, other than the membership amounts above, please use the PayPal button below. ACC deeply appreciates your tax-deductible contribution. Thank you! About the mailing list: ACC uses a third-party company that sends email to you, our subscribers, on ACC's behalf. Occasionally, some have reported not receiving emails. This is usually because your recipient email account server may send some of our email to your spam or trash folder. You may have to "trust" emails sent for us. Please check your trash or spam folder before reporting issues. If you have a persistent problem, please send an email to our "quiet" email address anacostiadc@outlook.com. ACC does not sell or rent the information (neither name or email address) you provide to subscribe. ​Still not receiving emails? ACC will always try to duplicate information we send by email here on this website so you will be in the loop! Especially check our Home page and the Upcoming ACC Events page for information that routinely appears in the email until any email issues are resolved. We appreciate your patience!